Roughcasting, otherwise known as pebbledashing or drydashing, is the most widely used exterior render finish in Scotland. Roughcasting is a popular choice with local authority refurbishment and regeneration projects: it’s a fast process; it offers a wide variety of colour choices; and it is very cost effective. The aggregate embedded in the through-coloured render background makes it very hard wearing and resistant to Scottish weather. It will neither change nor fade as all the elements are naturally coloured. 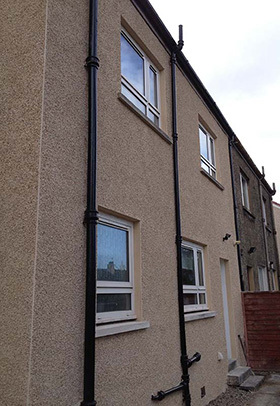 The final appearance of any roughcast project can vary enormously depending on colour. With up to 30 through-coloured renders to choose from and up to 50 decorative aggregates, you can rely on our expertise on which to choose.